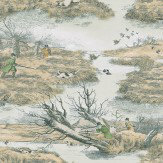 A supplier of unusual fabrics and wallpapers. 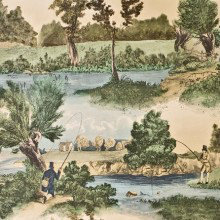 A vinyl wallcovering taken from Samuel Alken's series of shooting scenes from 1815. The originals were made by soft ground etching, which Lewis and Wood have emulated in this design. 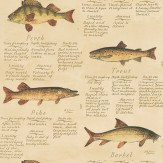 A truly original design featuring freshwater fish and fishing notes from A J Lane's fishing diary. 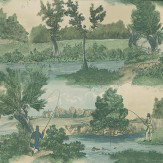 Lewis & Wood have created this wonderful vinyl wallcovering of early fishermen from a series of aqua tints produced around 1823 after George Morland, the renowned engraver. 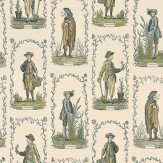 The Four Seasons prints were created in the late 18th Century by the London firm, Bowles & Carver. These unassuming publications were sheets depicting the daily life of ordinary people in England. They were created with considerable humour and charm. 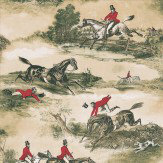 This hunting design has been created from original hand coloured lithographs made in 1860. The artist is believed to be Aiken or one of his followers. Please request sample for true colour match. If your looking for traditional and classic design for that British country house styling - then these papers are for you. An eclectic collection of feature papers.